The Montreal Canadiens, eighth seed in the Eastern Conference, and sixteenth overall seed in these 2010 NHL Playoffs, made like a vintage Britney Spears last night... oops, they did it again! After an impressive comeback series victory against the President's Trophy-winning Washington Capitals, the Canadiens earned a date with the defending Cup champion, Pittsburgh Penguins. Surely, they would run out of gas in the second round. Their post-season smoke and mirror routine would be exposed, right? They should have exhausted themselves after feverishly chasing around Ovechkin & Co. There is no way they could keep up the pace, while having to contend with Sidney Crosby... Well, not so fast! With an effort that would make any bleu, blanc et rouge legend proud, they eliminated another highly regarded contender. So, just how did Montreal accomplish the impossible... again? Quite simply really. To analyze this series, all one must do is take nearly any facet of the game, and add the word "out" to the beginning of it. The Canadiens, out-hustled, out-coached and out-played the Penguins in their victory. It was evident in nearly ever game. Loose pucks went to the Habs. The feet of each Canadiens player always seemed to be moving at a frantic rate, while the Pens coasted too often. Maybe it was just a sign that Pittsburgh had just played in too many games over the last few seasons and were starting to tire. Maybe Pittsburgh was expecting a coronation rather than a fight. Whatever the circumstance, the Penguins did not play with "the fear" like the Canadiens did. This is not to say that Dan Bylsma was somehow beaten by Jacques Martin in a kinetic chess match, or was embarrassed by a superior hockey intellect, but... Martin devised a plan that Bylsma and staff could not overcome. Just as he did with Washington, Martin used his shutdown pair of Gill and Gorges to bang, interrupt, impede and frustrate Sidney Crosby. Bylsma never was able to devise a counter-strategy that created more space for his one man band. The Habs committed to sitting back, collapsing on their goaltender and waiting for their opportunities to present themselves. At no point would they fall into the temptation to skate with Pittsburgh, and they stayed with their plan to the very last second. That is to say they out-executed Pittsburgh. As an extension of their superior effort and game plan, the results speak for themselves. The Habs treated every second of every game as if it were life and death. The Canadiens knew that they have no player with the natural skill of Crosby and Malkin. (Maybe no one does.) They knew that the Penguins skill level alone would create chances. They knew that there were going to be goals scored by Pittsburgh that they could do almost nothing about. They also knew that they would need to put forth every exhaustable effort not to give those opportunities away, and that their one chance was to make Pittsburgh earn every shot on net. Each game the Canadiens gave greater effort and played as if they had zero margin for error. They swung their sling 'round and 'round, and the Penguins fell victim to a rock-solid plan. In this space, we criticized Montreal. We said that they had the worst off-season of any team in the NHL back in October of 2009. Like the Caps and Pens, we were wrong about this group of skaters. The Canadiens are winners. Me no like this! Habs can go to HECK! Yeah right Mr. DiRienzo. 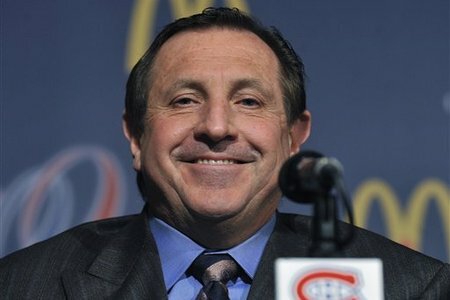 You'd rather say: Habs can go to United Center... and bring the cup back home. Where it deserved to be. Me like what I've seen so far. Season of Loss For the Red Wings. More To Come? Professional Hockey Began in Pittsburgh!